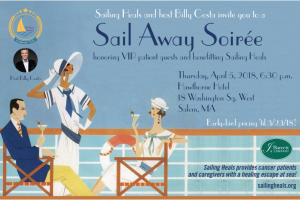 Our Sail Away SoirÃ©e was a great success! Read more below! Thank you to all who attended and supported our kick off to the season! It was a huge success thanks to all of you! Host: iHeart Media's Billy Costa! Uplifting VIP (patient guest) stories! Book Signing: Board Member, Boston bombing Marathon survivor and author, Jeff Bauman, will sign copies of his book, Stronger! Fantastic Raffle & Travel-themed Auction Items! Music and dancing courtesy of DeeJay Dan Maguire of Mansfield Entertainment! 'Vintage-sailing' or "Gatsby-style" dress encouraged...but optional! Fun photo booth by Back Stage Photo Booth for posting from the event! Thanks toÂ J. Barrett & Co.Â for being a Gold Level Sponsor for this event!